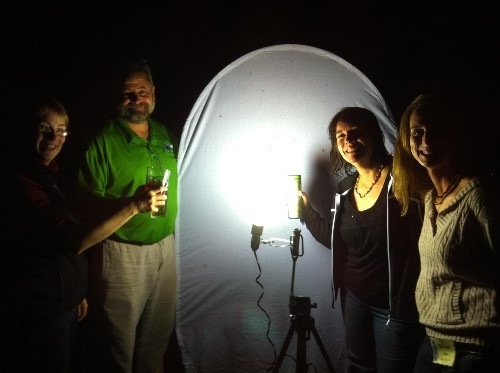 Mothing at the New River Birding and Nature Festival. Yours truly demonstrating her expertise by looking something up in her own guide, on the right. 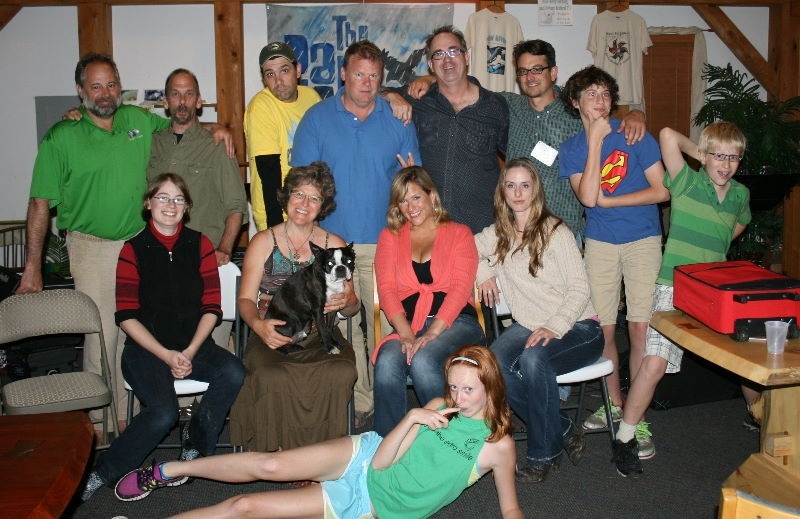 Two fellow bloggers among those on the left, Sara Stratton (blue shirt, centre) and Nina Harfmann (blue shirt, left). Photo by Jim McCormac. When I left Wheeling I headed south to join the New River Birding and Nature Festival, already in progress near Fayetteville, WV. I’d heard about the NRBNF from other bloggers who’d attended in past years and seemed to have a really great time, and I’d been keen to attend myself. However, West Virginia was a fair ways for me to travel. When I got the confirmation on the book tour I thought this would be the perfect excuse to finally make it down there, and I contacted the organizers. Lucky me, they were interested in having me come and do some events! 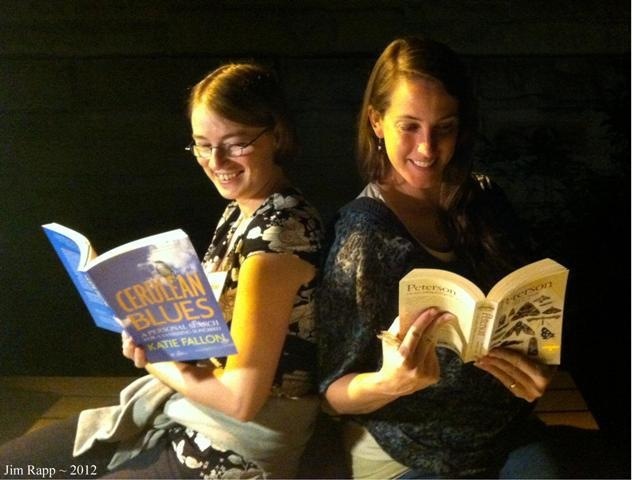 Book exchange with fellow author (there were a few there!) Katie Fallon. Photo by Jim Rapp. I arrived mid-afternoon on Wednesday and checked in to the cabin I was staying at with a few of the other festival guides: Katie Fallon (author of Cerulean Blues), Jim Rapp and Rachel Davis. They were there, relaxing in between the morning’s birding events and the evening’s dinner and entertainment; and they invited me in and made me feel immediately part of the group. They showed me to where dinner was being held (where I got to meet the wonderful Nina Harfmann, whose blog I discovered shortly after starting my own, and the inestimable Ohio naturalist Jim McCormac, who also keeps a blog that I highly encourage you to check out; go ahead, I’ll wait) and then later helped me with my event that evening. Honestly, half the reason I enjoyed the New River festival as much as I did was because of the people. Everyone was truly awesome. The event that first evening went well, and the moths were extremely obliging. It was one of the better nights on the trip, with great weather and an excellent selection of species. Many people peeled out early (having been up at dawn to go birding, and planning to be up at dawn the next day to go birding), but a small group of enthusiastic people, including my cabinmates and Jim McCormac, stuck around and indulged in the mothiness. We were rewarded at the end of the evening with a caterpillar hunter, a giant beetle that, unsurprisingly, is a predator on caterpillars. Check out Jim’s excellent post on the creature. The next morning I was up far too early, to co-lead a birding trip with Connie Toops and Bill Hilton, Jr. While I’d never met either I knew of both of them prior to the festival – Connie is co-author of a number of bird books; while Bill operates the Hilton Pond Center for Piedmont Natural History in South Carolina, as well as Operation Ruby-throat studying hummingbirds on their wintering grounds. We did a great trip through the forested hills of the region, seeing many Carolinian bird species we don’t get, or have in small numbers, here at home. I also got to see my first Zebra Swallowtails, a flashy butterfly species that doesn’t make it to Ontario. 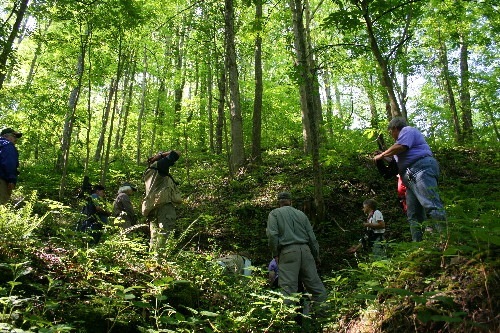 In the photo above, Connie (in the white shirt on right) is talking about coal mining in the region, pointing out a small mine in the side of the slope. 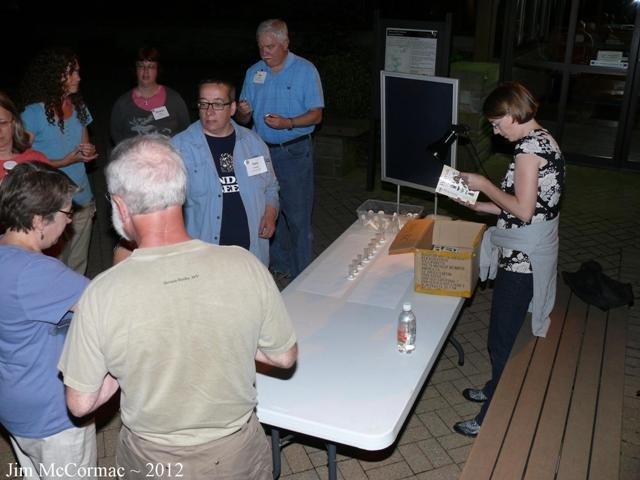 I did another talk that evening for a separate group participating in an Elderhostel program at a nearby state park. The following morning I returned to join the same group on another birding trip, along with Bill Hilton, Jr, again and nature columnist and radio show host Dr. Scott Shalaway. We got to take a jet boat out on the river, and while it was raining off and on most of the morning and therefore a little wet, it was also pretty amazing. 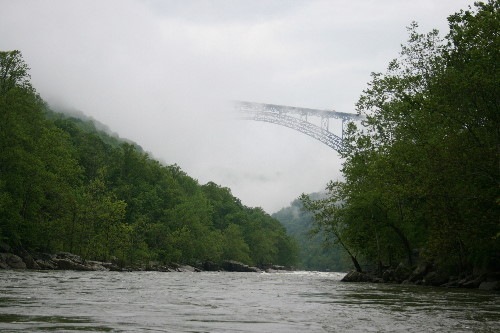 The photo above is of the main bridge crossing the New River gorge. To give you a sense of scale, there’s an 18-wheeler tractor-trailer crossing the bridge in this photo (above the second strut from the right). Yeah. It was pretty spectacular. The whole New River region is, really. 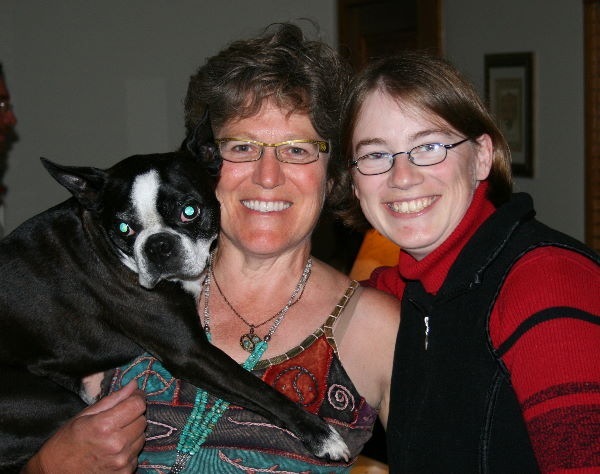 Julie Zickefoose and celebrity Boston Terrier Chet Baker, and myself. Grinning from ear to ear at the opportunity to meet one of my idols. Friday evening I didn’t do any mothing but instead enjoyed the post-dinner entertainment, a presentation by Julie Zickefoose. I have admired Julie pretty much since I discovered her blog in 2007; hers was one of the main inspirations for mine when I started it the following year. She’s the sort of passionate, dedicated person I would like to grow up to be, and I was super excited to have a chance to meet her. It was definitely one of the highlights of the trip for me – she’s every bit as friendly, generous and engaging as her blog makes her seem to be. 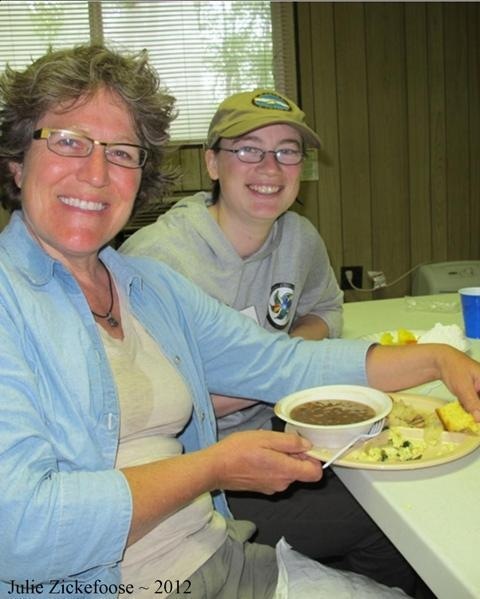 Enjoying lunch following a fun but very wet morning of birding the New River high country with Julie Zickefoose and Connie Toops. Photo by Julie Zickefoose. Saturday morning was wet, wet, wet. I was on a trip with Connie Toops and Julie Zickefoose; it absolutely delighted me to be able to spend the morning in the company of these women I admire. So I could overlook the fact that it rained for pretty much the entire trip. We made a few stops for local specialties such as Golden-winged Warbler, and did end up getting a number of our target birds despite the damp weather. The birds I was most excited about weren’t actually the ones most other people were – I was keen to see the southern species, the ones we don’t get here in Ontario. I was happy that we did get a bunch of these, or at least heard them. One of my favourite anecdotes from the tour was from this trip. We’d stopped someplace to check out some Golden-winged Warblers, and since the location was hilly and shrubby and it would be a while till we reached some washrooms, we thought it might be a good spot for a washroom break. While everyone else was checking out the warbler I carried on up the hill to see if it would be okay for the women to use. When I got up top it turned out there was a residence on the other side, some distance away but openly visible. They laughed when they understood (observing, “I know it’s West Virginia, but a hearse in the bush would be weird even for here.”). I found this greatly amusing, since I think it’s the first time my Canadian accent has ever caused a problem in communication. Honestly, I think I sound pretty much just like my American friends, but clearly there’s some difference , especially with the “ou” sounds. I got comments on my pronunciation both here and at other stops. Myself with Geoff Heeter (of Opossum Creek Retreat, and a coordinator of the festival), Mary Ann Barnett and Rachel Davis. Photo by Jim Rapp. Saturday night I did my last event of the New River festival, running my moth sheets at Opossum Creek Retreat while The Rain Crows played inside. It was a cool night, threatening rain, so we didn’t get too many moths to the lights. Still, though, it was a decent evening – just enough diversity to interest people. It was also the last evening of the festival, so there was a lot of socializing. I signed a lot of books, and chatted with a number of people whom I hadn’t had a chance to at any point earlier in the week. Met a lot of new folks, such as Dave Fitzsimmons, author of the fabulously-done children’s book Curious Critters (seriously; check that link out). I also got a couple of my own books signed, which I had brought anticipating that I’d meet the authors. This included Bill Thompson III, Julie Zickefoose’s husband, whom I admire nearly as much as his wife for all the stuff he’s involved in and how much he puts himself out there for other people. What a couple! Many of the awesome people I met at the New River festival, most of us guides. Left to right – back row: Geoff Heeter, Paul whose surname I’ve forgotten, Ben Lizdas, Jim McCormac, Bill Thompson III, Jim Rapp, Heeter Jr whose first name I’ve forgotten, Liam Thompson; front row: myself, Julie Zickefoose (with Chet Baker), Wendy Eller, Rachel Davis; and Phoebe Thompson lounging out in front. I was very sad to be leaving at the end of the week. I’d had such a good time there, met so many great people. Saw lots of interesting moths, including several lifers, species I’d never seen before. I’d definitely love to return, if I had the opportunity; unfortunately, West Virginia is no closer now than it was before, so we’ll have to see. Still, if you’ve got the chance to go yourself, I highly recommend it. Onward I go, next to Canaan Valley NWR in northern West Virginia! Sounds like you had a great time! Would you be interested in writing a post about your experiences writing this book for the ESC blog? (www.escsecblog.com)? Just wanted to say that I received your book today and am now going to dive in. I live in southern New Jersey, work at a site in a disturbed area of the Pine Barrens, and have a number of moth pics that I am going to i.d.